The game of the 2006 FIRST competition is AIM HIGH. There are two alliances, one red and one blue, of three robots each. There are three goals for each alliance, two in each corner and one in the middle that is high off the ground. The object of the game is to score as many points as possible by shooting balls through the goals. The corner goals are worth one point per ball and the center goal is worth three points for each ball. Each match is split into four sections - autonomous, red offense, blue offense and a final period with everyone on offense/defense. Each match lasts 2 minutes and 10 seconds. The autonomous period, in which robots are controlled only by the computer and onboard sensors, lasts 10 seconds. The team that wins autonomous mode plays defense first (and gets a 10 point bonus). The next three periods are each 40 seconds long. During the second and third periods, only one alliance can score while the other alliance tries to keep them from scoring. During the second and third periods there may only be two robots playing defense, the third robot must be in the offense zone or a 5 point offsides penalty will occur. During the final period both alliances can play offense or defense. 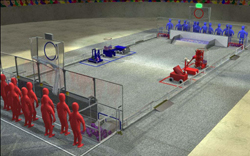 Each of the alliances can gain points by their robots being on the ramp at the end of a match. One robot is worth 5 points, two is worth 10 points and all three from an alliance is worth 25 points. Each robot must start with dimensions of 28" x 38" x 60" and weigh a maximum of 120 pounds (plus a battery). Each team will have two drivers, one human player and one coach each match. The drivers and human player must be high school students. Only the human player may throw balls onto the field. Size limit during play: 60"x60"x60"
39 Teams (.pdf, 24KB) attended the 2006 SBPLI Long Island Regional. 344 Teams (.xls, 201KB) attended the 2006 Championship. 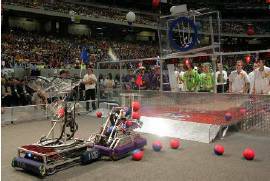 1133 Teams (.pdf, 342KB) participated in the 2006 FIRST season at 33 Regional events.